Paul Cooke expects Tom Hodson to fit straight in after re-joining Doncaster this week. The speedy winger is back for a third spell at the Keepmoat Stadium after completing his commitments with Huddersfield RUFC. 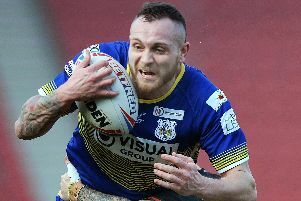 He is in contention to feature against Halifax this weekend as the Dons continue to go in search of their first win of the season. “Tom comes back into the group after finishing the season with us last year really well,” said Cooke. “He is a proven try scorer, bringing pace and another dimension to the team which can only be a positive for us. “Tom knows the players, the group and the division,” he added.